Gracilis is a very special plant. Not just slender, but a small variety of Weavers Bamboo in almost every detail. It's upright, compact, hardy and beautiful. 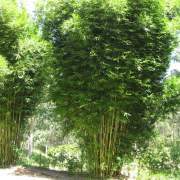 One of the best bamboos for hedges and privacy screens it is also easy to grow and very tolerant of heat, cold, frost and wind; looking great all year round, as long as you keep it watered and feed it, when needed. At 5-6 metres its not a large bamboo and will fit nicely into sites with limited space yet has all the charm and beauty of a large bamboo. 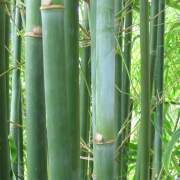 The new culms have the white powdery bloom that is a feature of many bamboos, and even though small in diameter, they become usable craft wood after 3-4 years, even though the timber is not as good as the other Weaver's Bamboos. 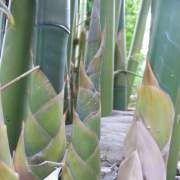 It can be as difficult to propagate as it is easy to grow, but is a preferred species with those who regularly use and buy bamboo.